This is the third of a three-part series on Caetano Veloso’s and Gilberto Gil’s years in exile. Part 1 of the series looks at why Caetano and Gil were forced into exile. In Part 2, the two musicians arrive in Europe, establish themselves in London and spend a year in Chelsea. 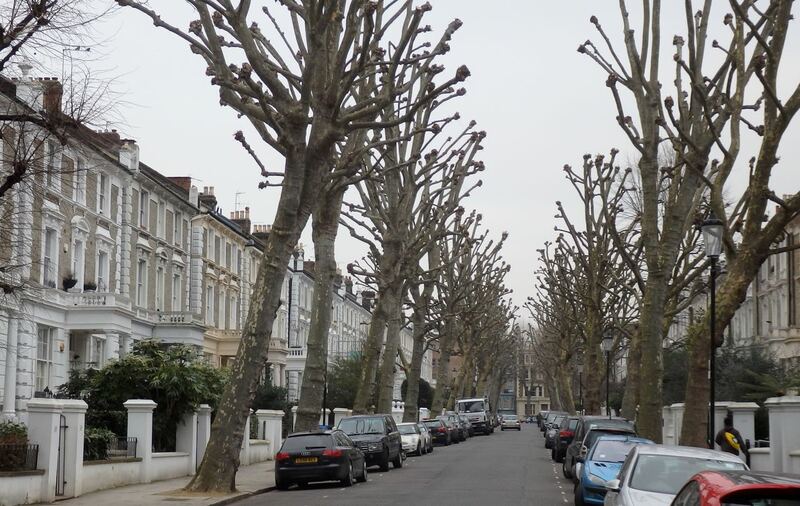 Here, in Part 3, Caetano and Gil move to Notting Hill and eventually find that they are able to return to Brazil. After about a year in London, Guilherme, Caetano and Gil and their families left the Redesdale Street house and moved a few miles north to Notting Hill. 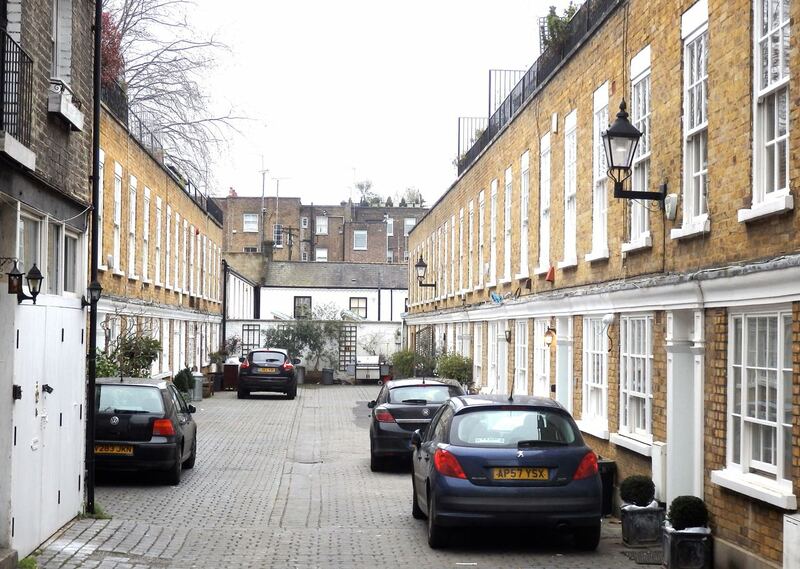 With the famous Portobello Road antique market, grand houses and squalid terraces, bohemian and immigrant communities and nascent social housing estates, this was a much more diverse a neighbourhood than was Chelsea. 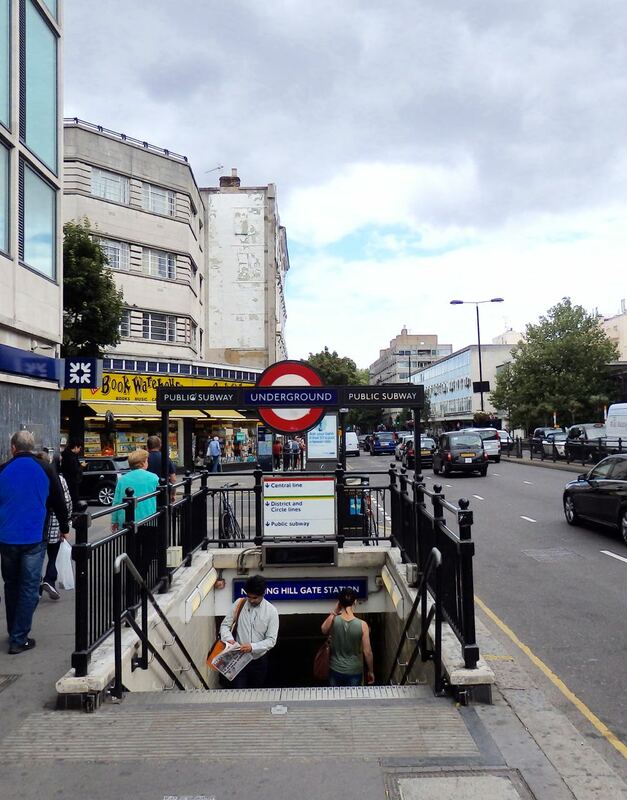 Gill entering Notting Hill Gate Tube. 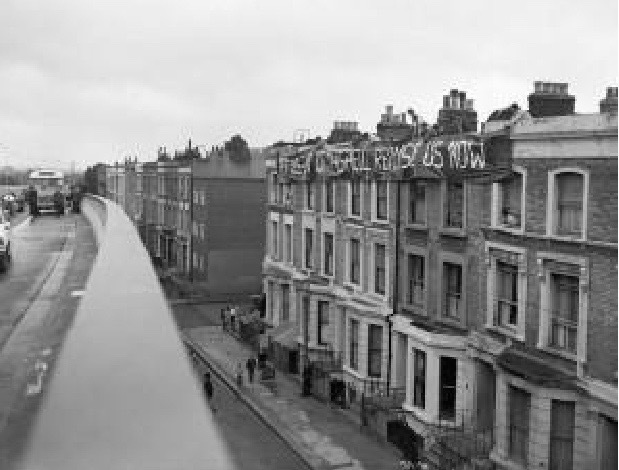 Notting Hill – or, more generally and more accurately, North Kensington – included a range of housing conditions. 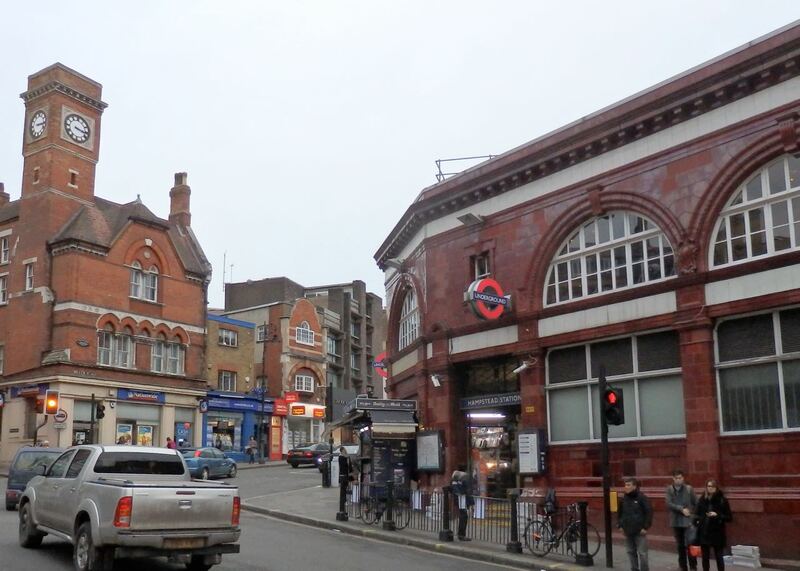 In the south – just north of Notting Hill Gate and Holland Park Avenue – were elegant mid-Victorian homes; from this southern fringe of the neighbourhood, Ladbroke Grove and Portobello Road extend northwards, passing through areas that in the ’70s were rundown or even slums. In the ’50s and ’60s, large numbers of immigrants from the Caribbean settled in North Kensington, usually living in overcrowded conditions and at the mercy of unscrupulous landlords. As is often the case in places undergoing sudden demographic change, social tensions involving the new arrivals and elements of the existing population (in this case white, working class) were often tense – and sometimes boiled over. In the course of a few years, North Kensington changed enormously, both in its ethnic composition and with the clearance of slums. In addition to West Indians, in the mid-60s Moroccan immigrants started to settle here (by 1980 North Kensington would have the largest concentration of Moroccans anywhere in Britain) and there were also sizeable Portuguese and Spanish communities. Whole streets were bulldozed, making room for new, often ill-conceived, housing projects and for the Westway motorway which sliced through the neighbourhood from west to east. Very gradually a process of gentrification set in, starting slowly in the ’70s and accelerating in the ’90s. 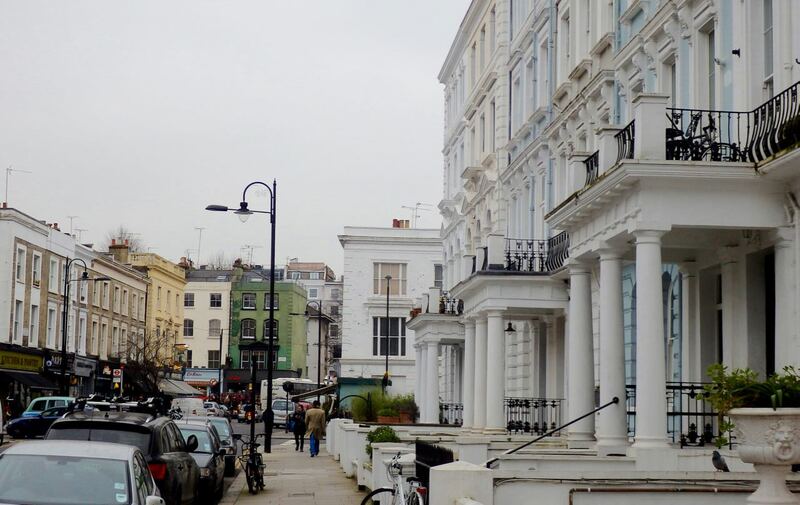 By 1999, the year the film Notting Hill was released, real-life Hugh Grants had firmly colonised the neighbourhood’s more southerly areas, while today even the once desperately-poor northern areas are highly-desirable places to live. 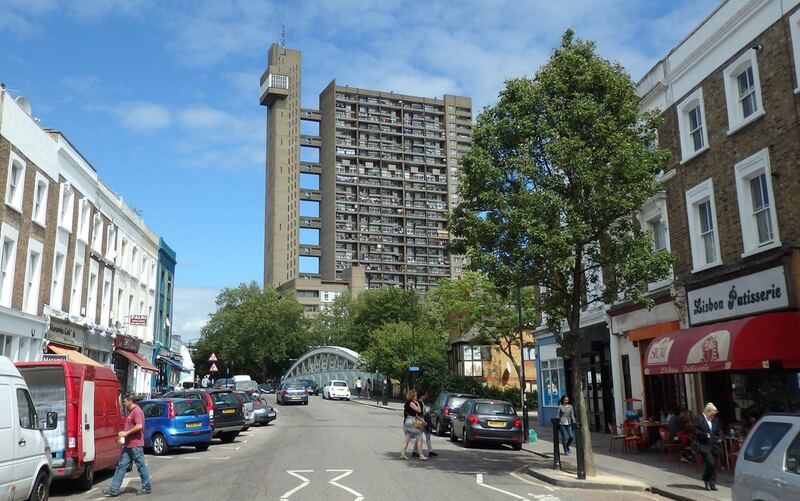 Built between 1966 and 1972 and located at the end of Golborne Road, Ernö Goldfinger’s Trellick Tower had a reputation for crime and vandalism, with people resisting being housed there. Today the building is widely considered a modernist masterpiece and many of the flats are privately owned. The Westway motorway (opened in 1970) crossing over Portobello Road. Since the days when Gil and Caetano lived in North Kensington, the process of gentrification has rapidly accelerated. Wanting a place of their own, Gil and Sandra left Chelsea with their baby Pedro and moved to Kensington Park Mews. This was a row of fashionable newly-built small houses that had replaced stables and carriage houses that once served local grand households. Caetano and Dedé lived just a block or two away in Elgin Crescent – “a street where every other house holds a rock band”, wrote Robin Denselow, early in his career as a music critic for The Guardian (17/07/71) – and later moved to Bassett Road, a few blocks further north. Guilherme also found a place nearby. 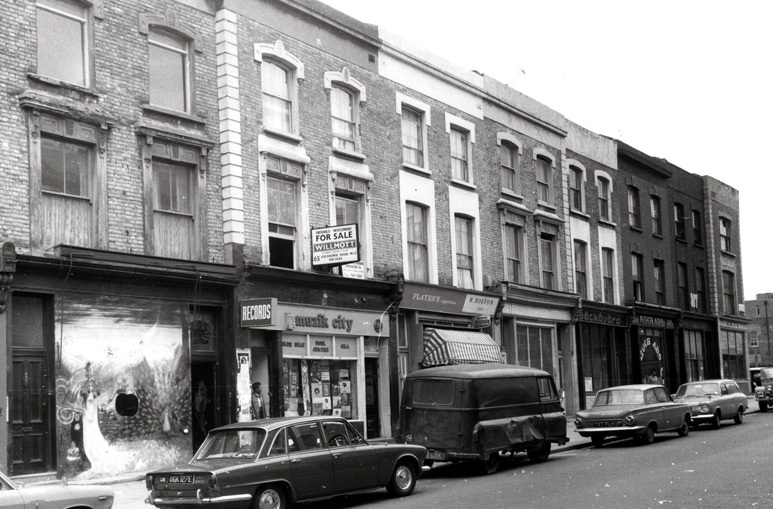 Like all parts of North Kensington, these streets certainly certainly included many houses in disrepair, but in 1970 they were beginning to effuse a sense of bohemian chic. 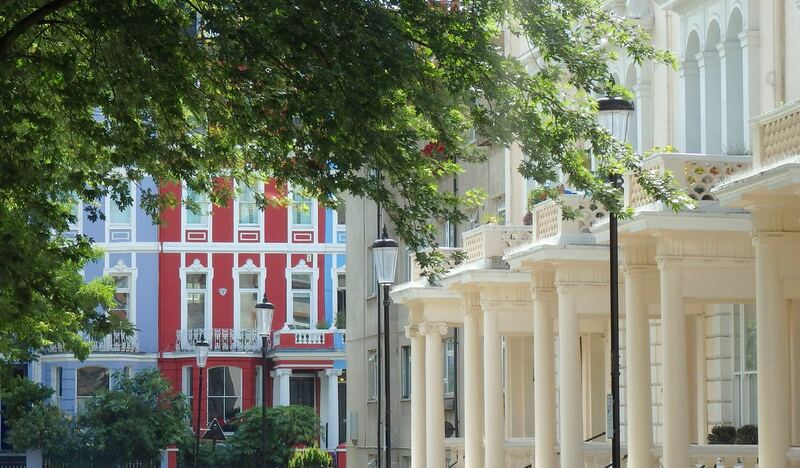 Elgin Terrace, looking towards Portobello Road. Still, whereas Chelsea might have had pretensions of being a centre of the “counter culture”, Notting Hill – indeed North Kensington in general – was far more authentic. The cosmopolitan area attracted squatters, hippies, musicians and political activists, as well as a growing band of privileged young people who would soon be derisively labelled as “trustafarians”. All in all, Caetano and Gil were a perfect fit! Gil (centre), Sandra (right) and young Pedro in Elgin Crescent, between Portobello Road and Kensington Park Road. 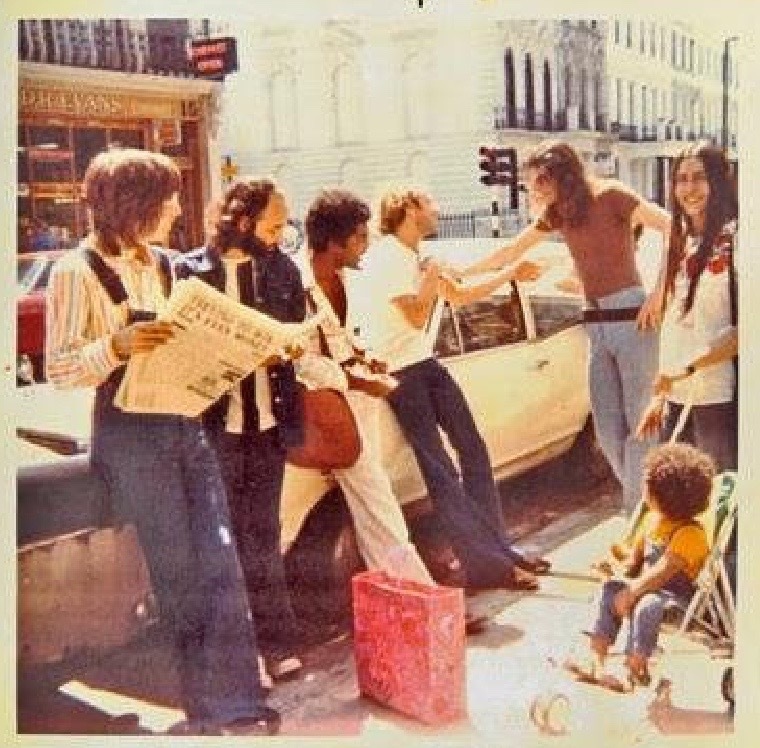 According to Robin Denselow, writing early in his career as a music critic for The Guardian (17/07/71), Elgin Crescent (where Caetano lived) was “a street where every other house holds a rock band”. At one time or another, members of Hawkwind, Pink Floyd, the Edger Broughton Band and other musicians lived or hung-out either in or around Elgin Crescent, sometimes All Saint’s Church Hall in the nearby Powis Gardens. One of Caetano’s neighbours was Arabella Churchill (a granddaughter of Sir Winston) in whose Elgin Crescent flat the first true Glastonbury Festival, held on a dairy farm in Somerset, was organised. Soon after being named as “debutante of the year” in 1967, Arabella rebelled against expectations of her and moved to Notting Hill, mixing with local hippies and musicians. 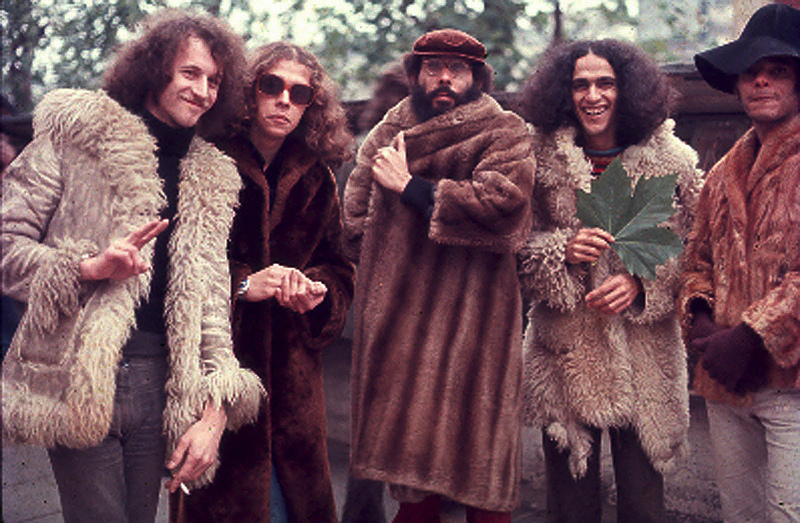 For the 1971 festival, Arabella – or more likely Thomas Crimble and Nic Turner of Hawkwind, other organisers – drafted in Gil and Caetano to help plan (and perform in) the event. In the run-up to the festival, which coincided with the Summer Solstice in late June, Gil and Caetano apparently spent several months staying in the farmhouse of Michael Eavis, another organiser, on whose farm the event was to be held. The free festival (paid for by wealthy supporters) is remembered as an important episode in 1970s youth culture and the start of an annual event would go on to attract well over 100,000 people each year. 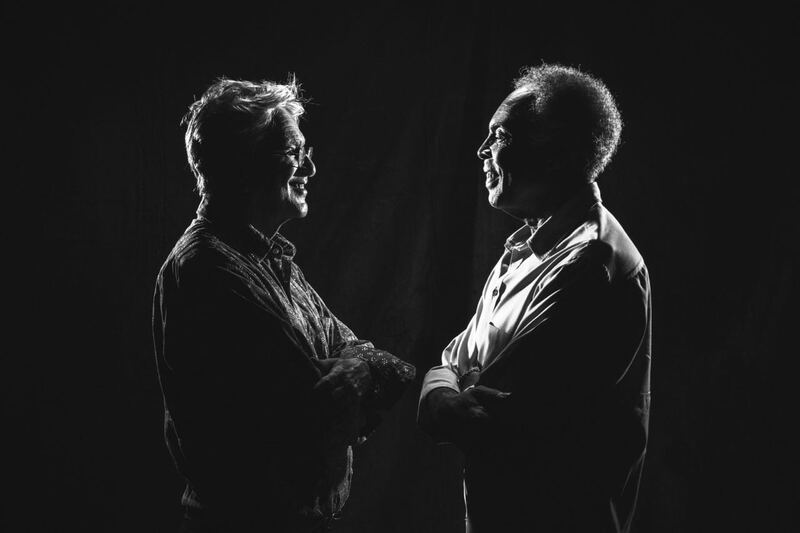 According to festival lore, Gil and Caetano are credited with broadening the festival beyond just music, to also include theatre, dance and other performance forms. Even so, on the iconic Pyramid stage – which Caetano is said to have conceived to channel cosmic energy from the ley lines – musical acts dominated, including Hawkwind, Traffic, David Bowie, Joan Baez, Fairport Convention, Quintessence, as well as Caetano and Gil. 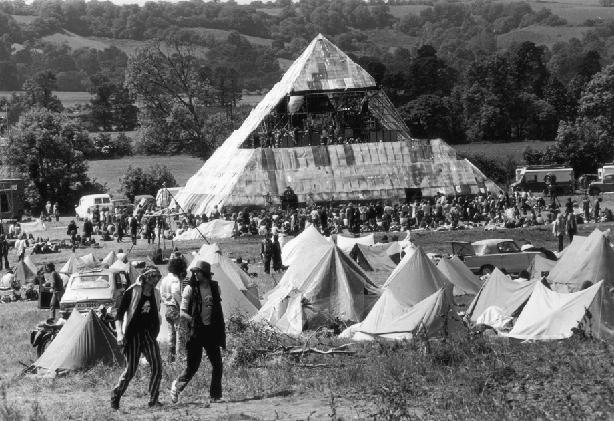 The “Pyramid” at the Glastonbury Festival, 1971. If one’s looking for London landmarks or geographic references in Caetano’s or Gil’s songs, there aren’t many. Sure, “London, London” highlights “green grass, blue eyes, grey sky” and the supposedly obliging policemen, but otherwise this song is about Caetano’s mood during his early months in in Chelsea. 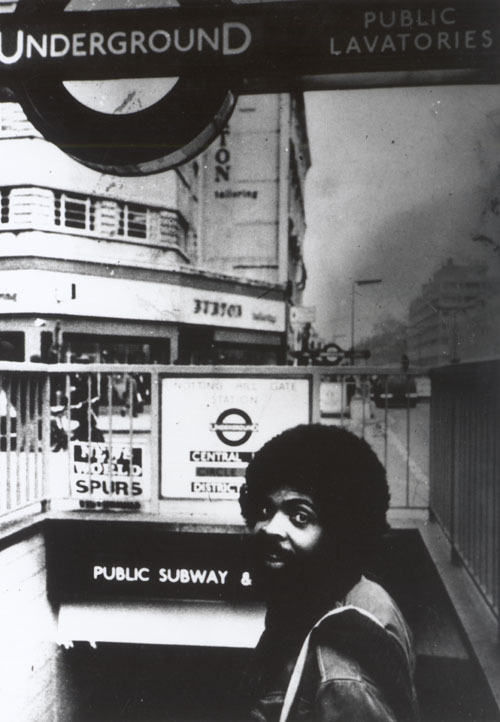 However, his 1972 song “Nine out of Ten“ begins with the line, in English, “Walk down Portobello Road to the sound of reggae, I’m alive“, while later he mentions the “Electric Cinema“…. Caetano often went to the Electric Cinema, at 191 Portobello Road, just around the corner from his home on Elgin Crescent. Opened in 1910 as the Imperial, the cinema spiralled into a state of decay reflecting that of its surroundings. 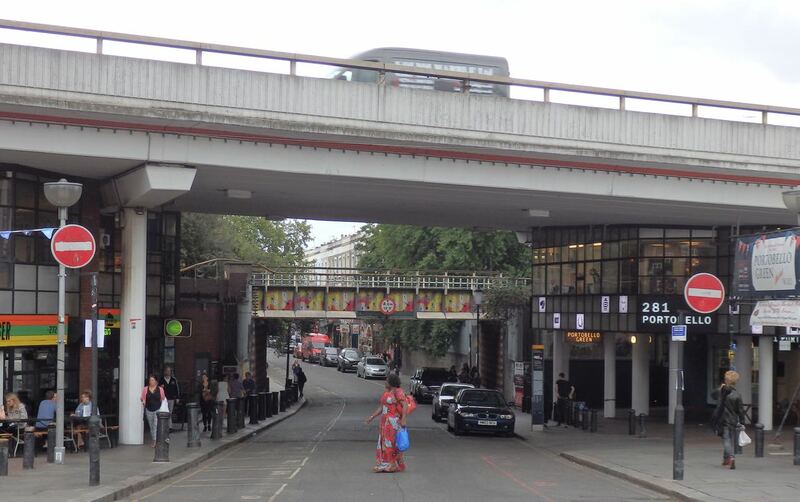 By the early 1960s the cinema was known locally as “the bug hole”, far more important as a place to deal drugs than for the films that were being shown. 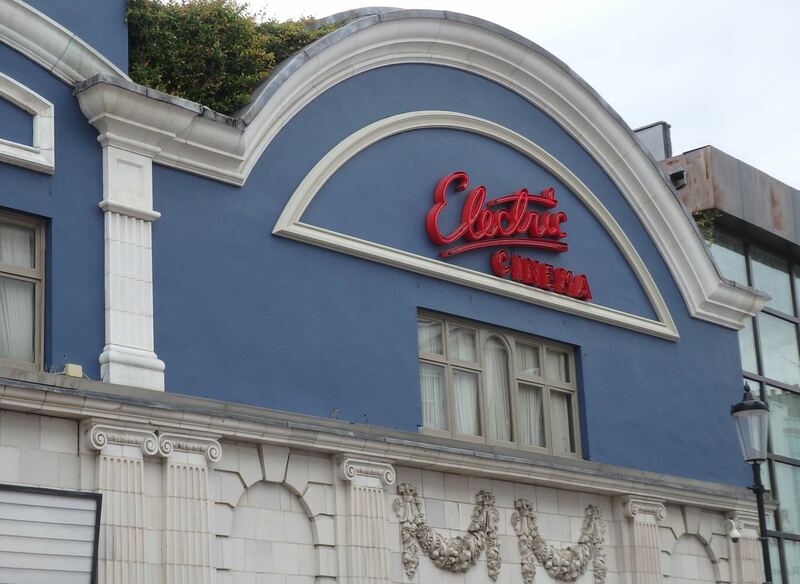 In 1970, when Caetano and Gil had moved into the neighbourhood, the rather lovely Edwardian baroque structure was transformed into the Electric Cinema Club – a “temple of cinema” showing a mix of classic movies and art house films. Eventually the original wooden benches were replaced by padded seats and in 2001, after a series of financial crises, the Electric was redeveloped into a luxury cinema experience, with comfy arm chairs and beds and a bar and restaurant serving gourmet food, cocktails and champagne. The Electric Cinema: 191 Portobello Road. 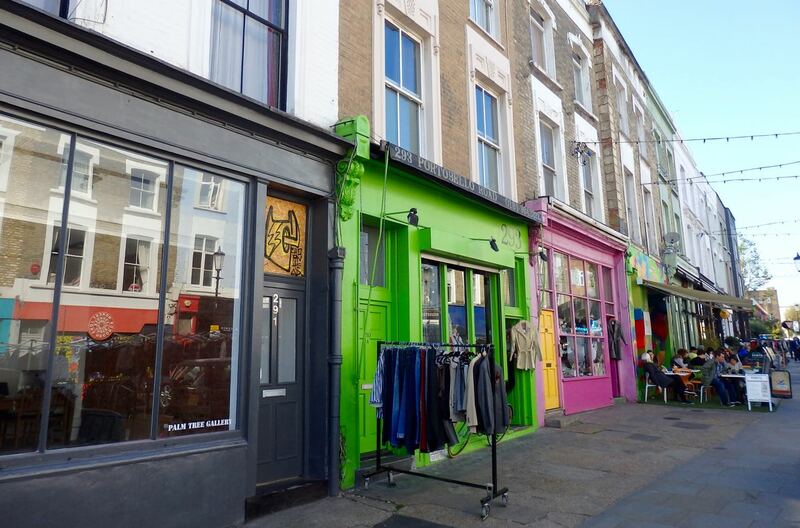 It was in North Kensington where both Caetano and Gil were first exposed Caribbean music – “the sound of reggae”, in “Nine out of ten“, that Caetano heard on his walks along Portobello Road. At this time, “reggae” was only just coming into being as the distinct musical genre that we now understand it to be. Calypso, ska and rocksteady – all considered “reggae” – were the predominate West Indian sounds – not until 1968 were the first records released in a style that would be considered as distinctively reggae. While it was the Jamaican band The Wailers (who included Bob Marley) who perhaps did the most to introduce reggae, in the late ’60s and early ’70s it was others, like Desmond Dekker, who brought reggae-type sounds to the attention of a broader international public. Like elsewhere, few record shops survive in North Kensington. 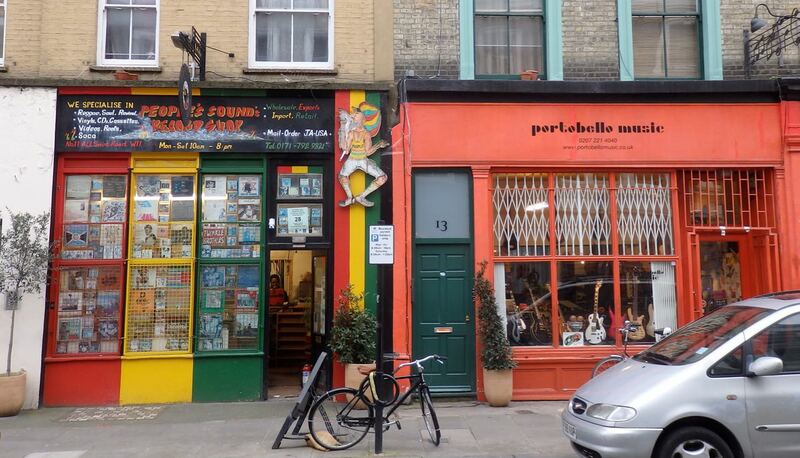 People’s Sound was first opened in 1981 though its Jamaica-born owner has lived in Notting Hill since 1956. Towards the northern end of Portobello Road there were shops selling records of West Indian, and Caribbean-style, music. (Then, as now, the Portobello Road had markedly different characters. The southern end largely consisted of antique shops and stalls; the northern end was “the sleaziest, most druggy” section, according to Howard Marks, the celebratory hash smuggler and dealer who at this time was living in Lansdowne Crescent.) Gil enjoyed browsing for records, with one of his favourite shops being the incense-infused “Forbidden Fruit” (at 295, between Oxford and Cambridge Gardens, just north of the Westway), a place commonly known as “the Afghan shop” because, in addition to music, it sold clothes and hippyish bric-a-brac. Forbidden Fruit, 295 Portobello Road the far left), north of the Westway. Apart from Gil’s discovery of a new genre of music – one that would have a lasting influence on him – he says that made other Caribbean contacts. Gil remembers going to the former Mangrove Restaurant, located at 8 All Saints Road, a couple of blocks east of Portobello Road, and would eat food similar to that of Brazil. But the restaurant was certainly not merely a place that served Jamaican-style rice and beans. Opened in 1968 by the Trinidad-born activist Frank Crichlow, the Mangrove was an unofficial community centre and a meeting point for black, and some white, radicals. The “hands off the Mangrove” demonstration. 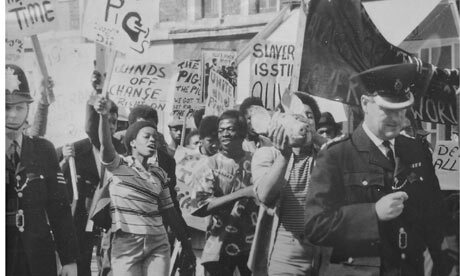 For decades, the police in the Notting Hill area were notoriously racist, targeting young black men in general, and those linked to the Mangrove in particular. Police officers were stationed along All Saints Road (and especially outside the Mangrove), supposedly to prevent drug sales, but essentially just to intimidate activists. The Mangrove was raided countless times, though naturally nothing was found on the premises – apart from the fact that Crichlow took a strong anti-drugs stance, given the regular police raids this would not have been a sensible place to deal. With tensions running high, an anti-police demonstration was staged in August 1970, the organisers demanding “hands off the Mangrove“. Nine protestors (“the Mangrove 9“), including Crichlow, were arrested and charged with various public order offences, including conspiracy to incite a riot. The two-months long high-profile trial concluded in December 1971 with all nine defendants being acquitted of of the conspiracy charge, and five (including Crichlow) were acquitted of all the charges. Even after the trial, All Saints Road was referred to as “the frontline”, with police maintaining an intimidating presence there and occasional raids on the Mangrove. 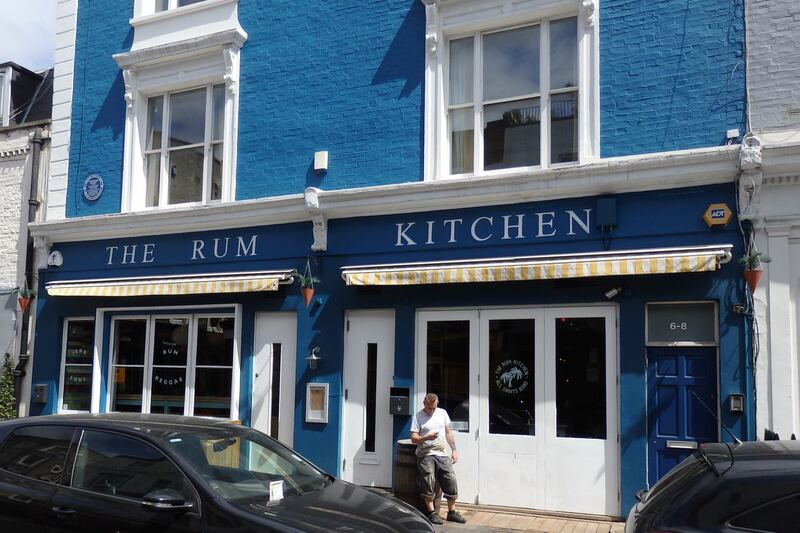 The Mangrove Restaurant closed in 1992 and was eventually– resurrected as the Caribbean-style Rum Kitchen, a completely unrelated business. Gil had become a vegetarian in prison, and turned towards a macrobiotic diet. 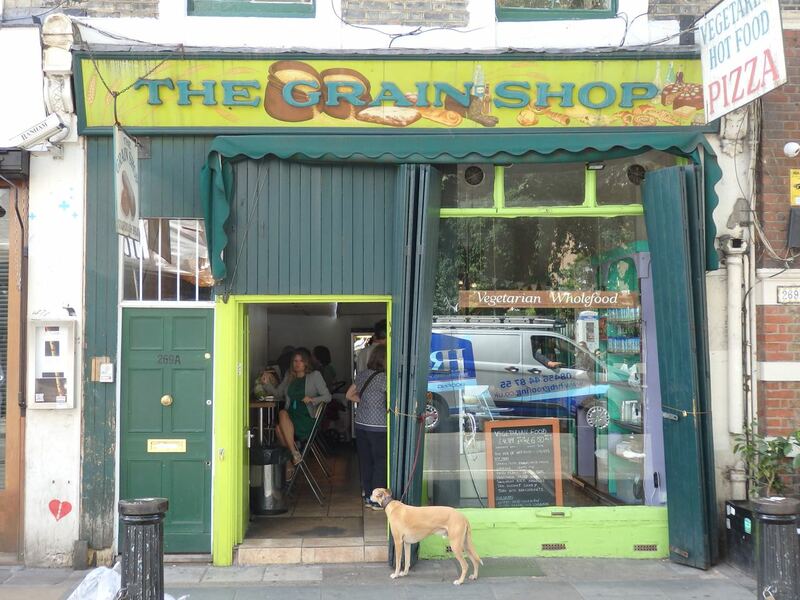 A few doors down from the Mangrove was Ceres Wholefoods, which moved in late 1970 to 269 Portobello – where it continues to exist as “The Grain Shop“. Strangely, considering his position as an exile, he was twice allowed to return to Brazil during the course of the year that Caetano lived in Notting Hill. The first trip was in January 1971 when Maria Bethânia (Caetano’s sister) obtained permission from the military authorities for him to attend their parents’ 40th wedding anniversary celebrations in Bahia. On arriving in Rio, Caetano was separated from Dedé and interrogated for six hours by military officials. After rebuffing a demand that Caetano compose a song in praise of the planned Trans-Amazon Highway (a “prestige” project designed to project the power of the Brazil that was being shaped by the military government), he was released on condition that he would remain in Salvador and neither cut his hair nor shave – the idea being that the military couldn’t later be accused of mistreating him. Caetano also agreed to make two television appearances, apparently because his military minders wanted his stay to appear “normal”. Caetano returned to London “truly frightened”: he witnessed for himself the fact that the dictatorship was firmly in control and he couldn’t imagine being able to return any time soon. Still, he was somehow “reanimated” by the trip home. On his return to England, Caetano threw himself into completing his first London album and then, collaborating closely with his Brazilian friend (and fellow Tropicalista) Jards Macalé, began work on Transa, what would be his second London album. In August 1971, Caetano again travelled to Brazil. 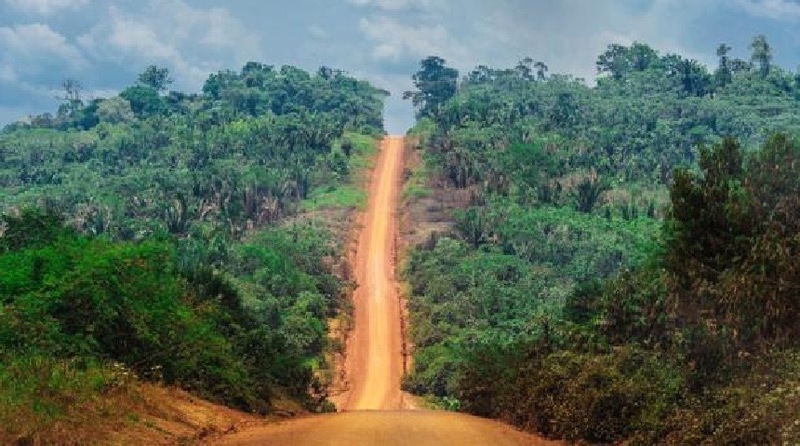 This time the journey was at the behest of João Gilberto – the singer, songwriter and co-creator of the bossa nova sound – who was recording a television special in São Paulo. João Gilberto, a musical hero of Caetano’s, was neither a leftist, nor even particularly interested in politics, and was able to reassure Caetano that he could guarantee that he wouldn’t have any problems entering Brazil. 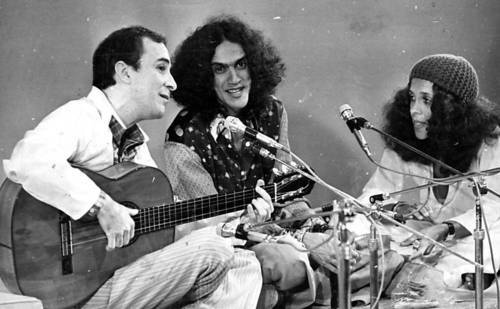 The following day, Caetano and Dedé flew to São Paulo where he, João Gilberto and Gal Costa together performed for the television show. 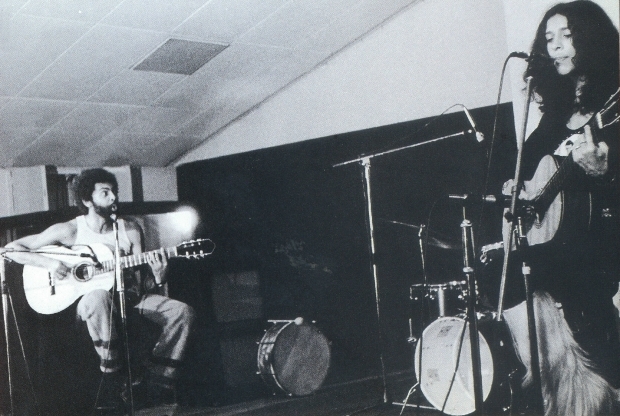 João Gilberto, Caetano and Gal in São Paulo, 1971. With Caetano’s second visit to São Paulo, the seed was planted in his mind that it might soon be safe to return home for good. 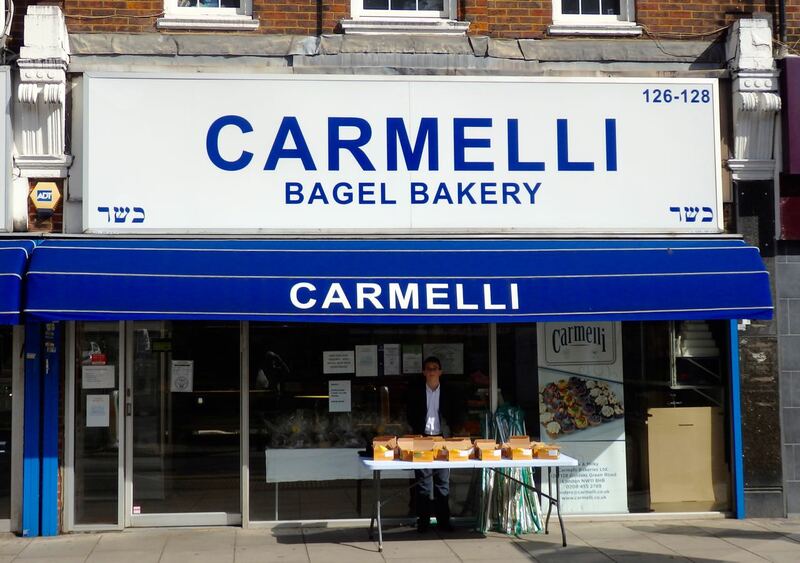 Soon after returning to London Caetano, Dedé, Gil and Sandra moved to the north London suburbs, first to Hampstead and finally to Golders Green. Gil, Sandra and Paulo also left Notting Hill, moving to Hampton Court, alongside the Thames River in southwest London, a suburb best known for the royal palace once that was owned by King Henry VIII. Again, why and exactly they lived here isn’t clear. 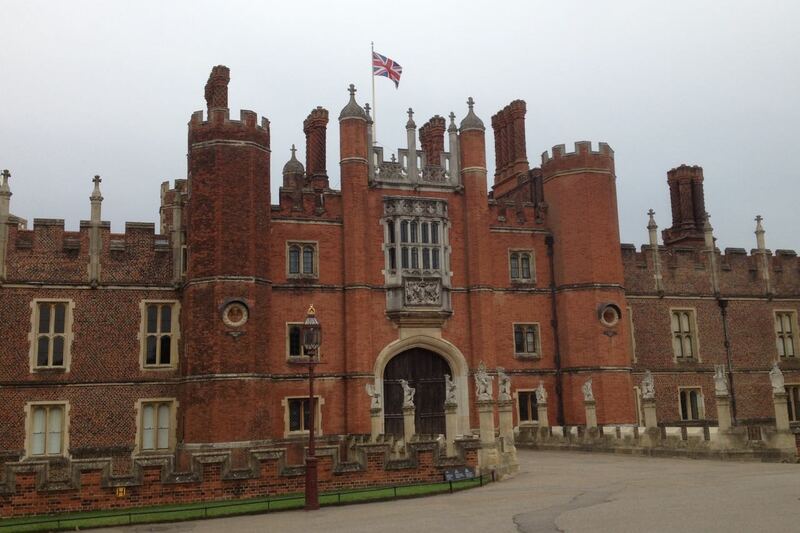 As with Caetano, Gil’s attention was increasingly directed elsewhere – it’s unlikely that he sought out a home in Hampton Court but, presumably, he was simply offered accommodation somewhere there. Caetano (with the beard) and Jards Macalé – and others! Meanwhile Gil was increasingly in demand, performing widely across Europe. In early October he paid his first visit to the United States, performing for a week at the St. Clement’s Theater of Latin America, spending time with the artist Hélio Oiticica and meeting João Gilberto for the first time. A New York Times reviewer (the jazz musician Dan Heckman) wrote that “quite simply, Gil is a first-class performer who should be heard by an audience considerably larger than the one [that was] available to him”. Gil and Gal: 26th November 1971. “Something remarkable seems to be coming out of Brazil, besides bossa nova and an awful lot of coffee”, Melody Maker, 04/12/71. ….it was when [Gil] combined with the gorgeous Miss Costa that something really special seemed to happen. It is not only that she has a voice as lovely as her supple, seemingly boneless body, but that when both were on stage together a musical alchemy took place that filled the little hall with some sort of positive charge felt by everyone. Musically, she and he seemed to counterpoint each other, nevertheless arriving back at the same conclusion with the sort of happy surprises with which one greets a master tabla player and sitarist when they are in complete rapport. ….not all soloist got the attention they deserved: Brazil’s Caetano Veloso brought out the first album he made since moving to Britain, and his subtle, lyrical songs went almost unnoticed. Caetano returned to Brazil for good in January 1972. Performances were immediately organised for him, first in Rio, then in São Paulo and Recife. The shows, based on his newly released album “Transa“, were exactly the same as the one at Queen Elizabeth Hall a couple of months earlier. Not only did Caetano bring new compositions from London, he also brought new sound equipment as well as an English sound engineer, Maurice Hughes. I came truly to love the green in the parks, the calm in the crescent-shaped streets, the alleys, the mosses and flowers – in sum, there came to me there a kind of wisdom about life, in a genuine and intense way, such as I had never imagined I could find. I honored the public and the private gardens alike with sincere reverence, but every day I would steal a rose from one of them to bring to Dedé. I shaved my beard and stopped feeling sad all the time. I met great people and managed to overcome the bad feelings of exile. I had three good years. We arrived the week The Beatles released Abbey Road, saw the Rolling Stones at the Roundhouse, jammed with Weather Report, heard reggae. A great experience. [….] London remains my second home. When recently asked whether they could ever imagine living in London, Gil said yes, whereas Caetano said that he could more imagine living in Madrid or New York. The fact that the experience of living in London was forced on them remains a strong feeling for Caetano. Despite their mixed memories and complex feelings towards London, they both regularly return to the city to perform, usually individually, but occasionally together. The concert halls where they perform are always filled to capacity, attracting mainly Brazilian audiences of all ages. Caetano Veloso, Tropical Truth: A Story of Music and Revolution in Brazil (London: Bloomsbury Publishing, 2003) [first published as Verdade tropical (São Paulo: Companhia das Letras, 1997)]. Current location photos by the author. Other pictures may be subject to copyright & only low resolution have been used to protect them. Pictures will be fully credited or withdrawn upon copyright holder‘s request – no commercial infringements are intended. To show support for The World Elsewhere, please visit the home page to subscribe to the blog and/or “like” on Facebook! Thank you! !